One of the things I usually enjoy about Frieze is strength of the commissioned projects; indeed Pierre Huyghe’s Recollection remains my strongest – um, sorry – recollection of last year’s fair. 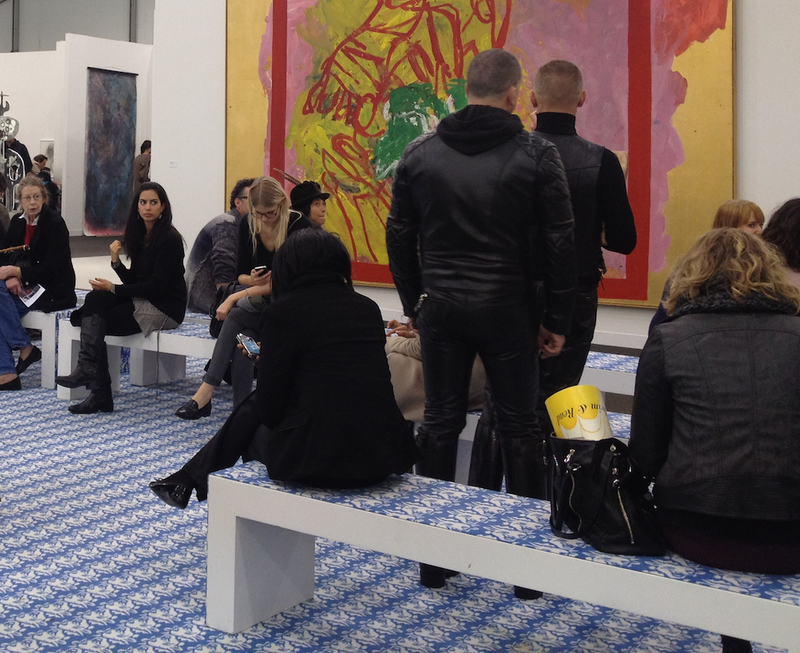 So what of Frieze 2012? Well, sadly the first of this year’s Frieze Projects was somewhat lost on me. 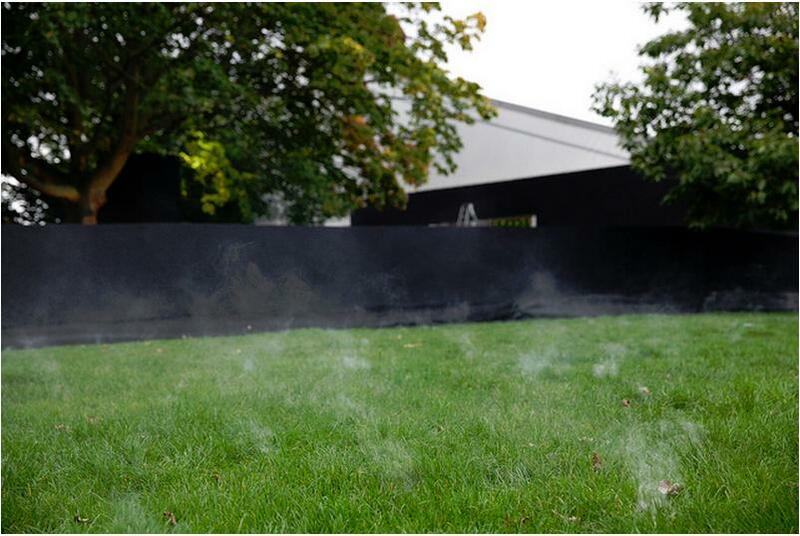 Though I like the idea of Joanna Rajkowska’s Forcing a Miracle – transforming an area of the park into a gently smoking field of incense – my engagement with the piece was reduced to, well, pretty much zero really by having a cold and not being able to smell anything. Incense in the open air is never going to have the intensity it achieves in a confined space, but even so under other circumstances this might have made rather more of an impact on me. Certainly the next project announced itself rather more loudly. 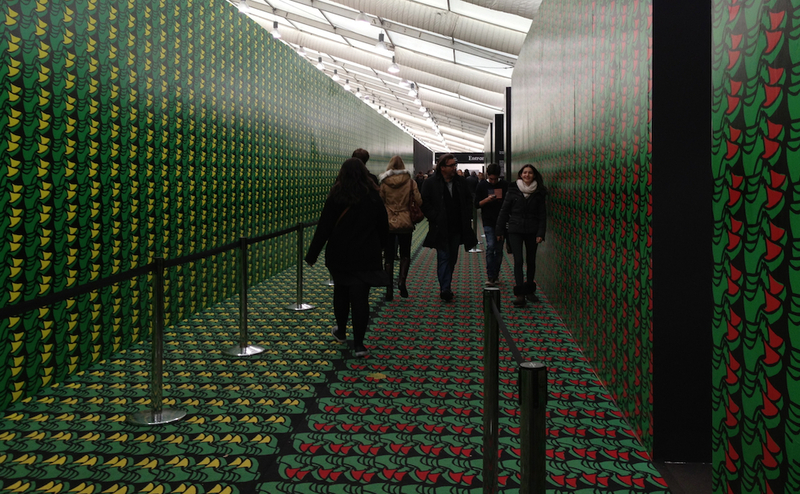 Thomas Bayrle’s Sloping Loafers/Smooth is art as hard-to-miss interior decoration, with a brightly coloured image of shoes turned into a repeat pattern covering for the floor and walls of the passageway leading in to the fair. Inside several of the seating areas are decorated with the Laughing Cow cheese logo reworked in blue and white. In a way, the garishness of Bayrle’s piece acts as an advance warning system, reminding visitors from the outset of the visual excesses ahead. While it’s not something that will stay with me as a piece of art, it did make me smile and in a way the closed in feeling it gives the entrance corridor means that one emerges into the fair with a feeling of relief at the sudden spaciousness, though obvious the reality of this as a frenetic and crowded space hits home soon enough. The next project I come across – and it’s one with several incarnations around the fair – is This Is Your Audio Guide, Cecile B Evans’s guide to the fair. 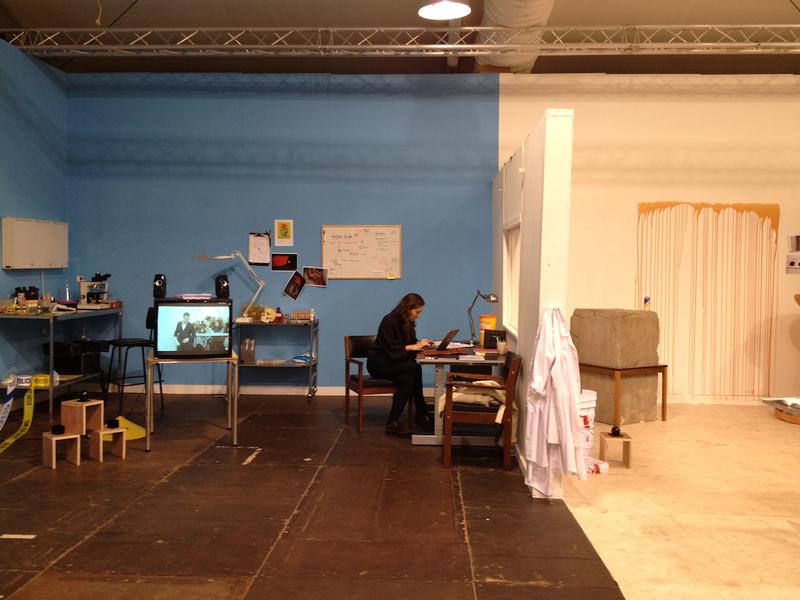 This work – winner of the 2012 Emdash Award – took the form Simon Schama presenting the views of assorted non-experts on works on show at Frieze. One of the things that characterises events like Frieze is the adoption of the terminology of contemporary art and the market and off-setting this with more subjective commentaries is an intriguing intervention. 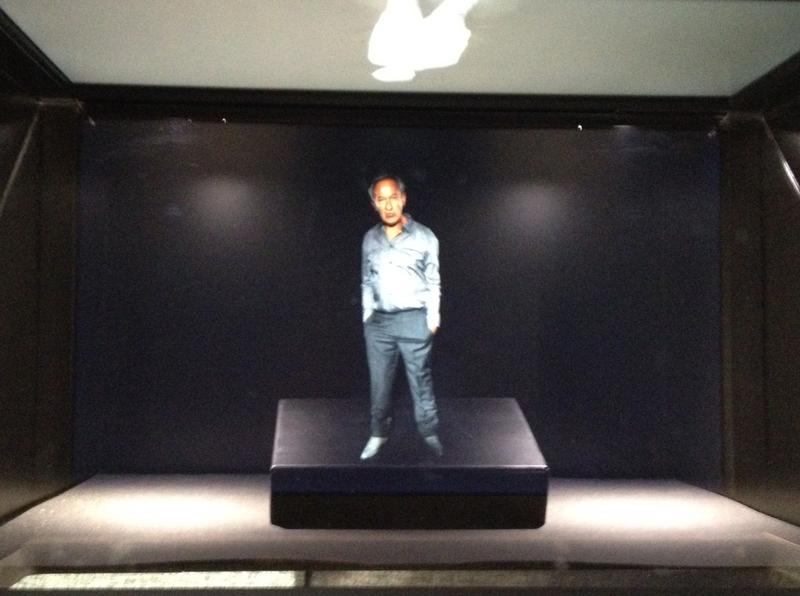 That Evans adopts technologies such as holography in order to do this adds to the fascination of the piece. Whether I found all the audio guide points or not I’m not sure, but certainly I was actively on the lookout for them. 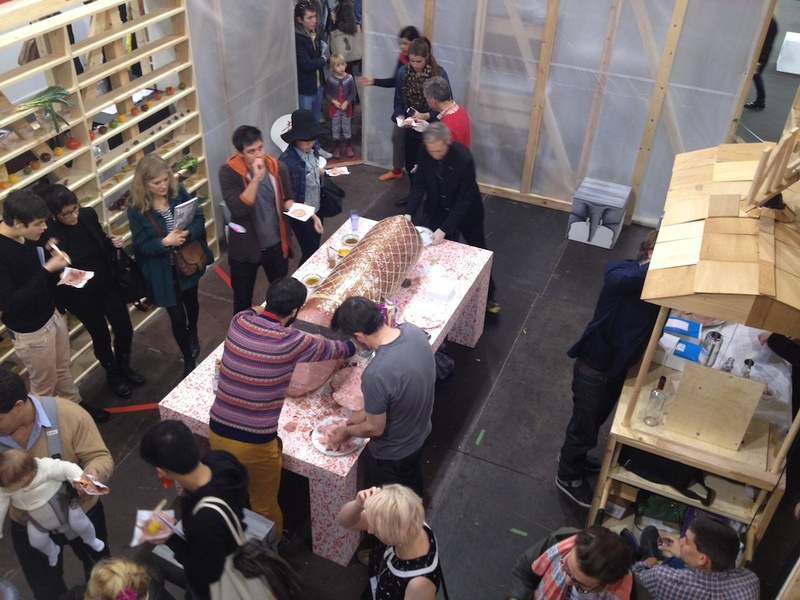 The project that probably excited me most though was the Grizedale Arts/Yiangjiang Group stall Colosseum of the Consumed which brought the sort of eating and shopping opportunities that would not normally feature at an event like Frieze Art Fair. Some aspects of this weren’t pleasant – this vegetarian found the smell of the enormo-sausage being consumed on Saturday afternoon hard to bear, but is thankfully she stayed away from the vermin dinner earlier in the day – but the somewhat ad-hoc village fête feel to the installation was a pleasing contrast to the perfect white wall spaces of the gallery stands. The event in the Colosseum of the Consumed I would most have liked to see the performance by Bedwyr Williams which involved the artist performing an autopsy – with, I think, added eating of body parts – on the body of a curator. Admittedly the curator in question was in cake form but nonetheless the combination of Williams’s intensity and the bonkerness of the undertaking makes this sound like something I would have really enjoyed. The last of the projects that I looked at – Aslı Çavuşoğlu’s Murder in Three Acts – was fascinating and layered but ultimately, as the aftermath of a performance, somewhat baffling. The complexity of the evidence left on display was such that it was possible to draw several different conclusions about what might have happened in the space. This is a work I would have liked to be able to spend more time with but such is the nature of an art fair that one feels driven to move on far too quickly for fear of missing something even better round the next corner. 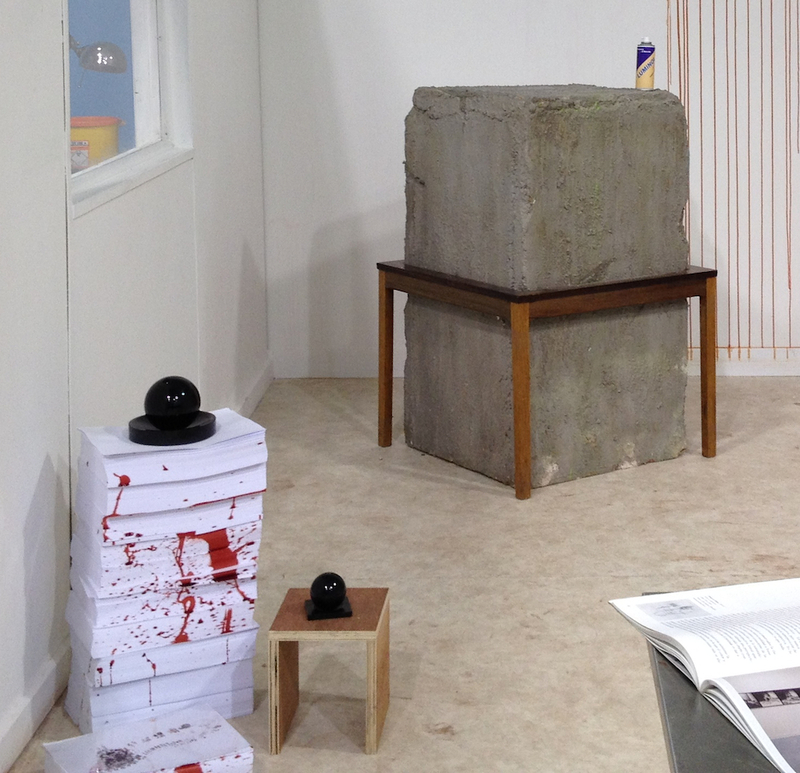 The basis of the work is an art fair stand complete with sculptures on plinths and shelves but with what look like blood-spattered walls and bloody footprints. Crime scene tape closes off small parts of the space but there is a lot to look at. This is familiar territory of course, but it’s familiar from film and television rather than the gallery; even the most avid armchair investigator, ever on the lookout for clues when watching police dramas, would be hard-pushed to make complete sense of a narrative frozen in time. Arguably then all this year’s projects are connected by bring non-art narratives, and non-art language, to the fair. Given the nature of the event and the attendant uncomfortable rubbing along of art market and art audience, this is an interesting leveller. The intrusion of other aspects of culture is inevitably jarring; here the moments of disjunction caused by the projects are welcome distractions. Although I am a bit cross I didn’t get any cake. This entry was posted in Art fairs and tagged Aslı Çavuşoğlu, Bedwyr Williams, Cecile B Evans, Colosseum of the Consumed, Forcing a Miracle, Frieze, Frieze Art Fair, Frieze London, Grizedale Arts, Grizedale Arts / Yangjiang Group, Joanna Rajkowska, Murder in Three Acts, Sloping Loafers/Smooth, This Is Your Audio Guide, Thomas Bayrle, Yangjiang Group by Ann Jones. Bookmark the permalink.